The Pratt Rectal Speculum is simply magnificent. 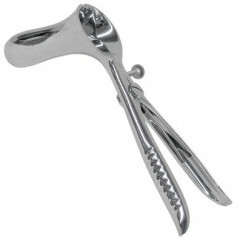 It's edges are rounded smooth making it comfortable, and one of my favorite medical speculum type instruments. To start with, this tool looks and feels really good. It has a nice hefty feel in the hand. Smooth insertion makes it very comfortable. The retaining screw allows for incremental opening -- or just squeeze the handles tight for a wide-eyed surprise. What was most unexpected for me is that when open this tool leaves a lot of rectal tissue exposed---making a great opportunity for digital stimulation and easy access to the prostate.